Something about herbs, spices, and seasonings. Chances are if you ever peeled, sliced or shredded a potato you found it didn’t take long for the nice white color of the potato to turn a lovely shade of brown. This happens because the oxygen in the air reacts with the enzymes in the cells of the potato which quickly changes the white potato to an unappealing brown color. The same is true with apples. Oxygen also reacts with that fresh cut salad turning the edges of the leaf brown. Luckily, there is an easy solution to stop the oxidation. The simplest method is placing those peeled potatoes and sliced apples in water. This works well when there is only a limited time between preparation and cooking and when the pieces of potato and apple are large. If you shred the potatoes and apples, the oxidation occurs very quickly. In fact, when I shred potatoes using my KitchenAid stand mixer’s shredding attachment, the potato starts to brown almost at the moment it’s coming out of the attachment. In this case as well as when sliced apples are to be displayed, I turn to McCormick Anti-Oxidant. Through the magic of chemistry, this product, which is made primarily with food grade citric acid, effectively stops the browning of sliced fruits and vegetables. For potatoes, simply mix up 1 1/2 tsp of McCormick Anti Oxidant with each quart of water (or 2 tbsp to a gallon for larger needs) and let the potatoes sit in the solution for three minutes and then drain. For shredded potatoes, put the anti-oxidant mixture in a bowl placed directly under the shredder to cath the shredded potatoes as they fall out. For green vegetables such as cucumbers and lettuce, use 1/2 tsp anti-oxidant to 1 gallon of water. One gallon of solution will treat 40 pounds of vegetables and fruit. One of the best reasons for using anti-oxidant with foods instead of other solutions such as lemon juice is the pure citric acid adds no tastes to the food. When I used lemon juice to prevent the browning of my sliced avocado it always added the taste of lemon to my salads. You can see from the picture above how white the shredded potatoes are in the anti-oxidant solution, and they stay that way while cooking. 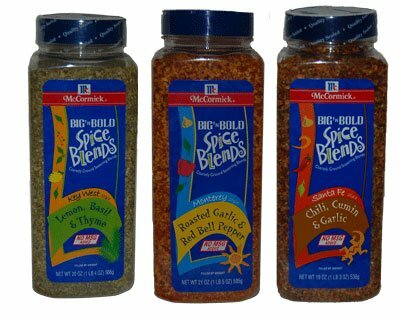 New at our Spice Place online store are McCormick’s Big and Bold Seasoning Blends. This is a line for very unique blends of seasonings from McCormick that we’ve simply fallen in love with. The flavor experts at McCormick have crafted some very delicious and savory blends into these seasonings. Each of these seasonings has a unique blend of herbs, and spices and they contain very little salt. We offer each of these spice blends in professional chef size containers ranging from 19 to 21 ounces. Ranging in taste from Key West’s citrus flavor through Santa Fe’s cumin chili taste to Monterey’s red bell pepper seasoning, the McCormick Big and Bold Seasonings are a treat for the taste buds. These seasonings can be simply sprinkled on your foods, or mixed with liquids such as vinegar, lemon juice or water to make a delicious marinade. The flavors are unique, and will add a whole new set of tastes to your meals. Key West Style – A blend of lemon peel, basil, thyme and other herbs and spices for use on shrimp, seafood, chicken, beef, and pork. Monterey Style – Bold Red Pepper and Roasted Garlic flavor goes well with chicken, fish, seafood, pork and beef. Santa Fe Style – A rich taste of the southwest seasoned with chili, cumin and just the right amount of garlic. 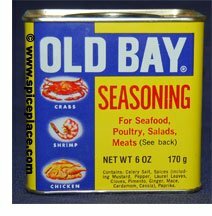 Use with beef, pork, chicken and seafood. Blend 1 tbsp with a pound of lean ground beef for a Santa Fe style hamburger. As the summer barbecue season approaches, curious chefs should consider this line of seasonings for there backyard cooking. Each seasoning has it’s unique taste that will make your outdoor cooking taste great and you’re certain to receive rave reviews of your recipes from your guests. 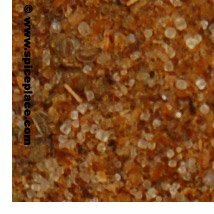 Cinnamon, perhaps one of the most popular and tastiest of spices (although many don’t think of it as a spice), is a substance which many enjoy on a daily basic but do not know much about. Despite its wide use throughout the world, especially in America, millions of people are not even aware of where it comes from. Cinnamomum verum, also known as Cinnamon (the tree), is an evergreen ranging from ten meters high to fifteen meters. Cinnamon (the spice), is made from the bark of this tree. However, while producing its edible bark (after some preparation, of course), the tree also composes fruit, which comprise only of very small, purple berries. The berries are not the prime product of the tree that humans are concerned with. While the tree is only native to Sri Lanka, it has been cultivated commercially in many tropical countries including Brazil, Vietnam and Madagascar. Surprisingly, and contrary to the smell of cinnamon, the leaves of the tree give off a foul odor. The name “Cinnamon” is from Greek origin, but also has some Hebrew and Malaysian roots. Besides making cinnamon spice itself, there is another thing that the bark of the Cinnamon tree is good for. That use is the creation of the cinnamon oil, which is made through a slightly complicated process. First the bark has to be pounded roughly, soaked in sea water, and finally distilled. The oil has a gold-like color, and smells very similar to regular cinnamon. Cinnamon is not a spice that can be made hastily. The tree must be grown for at least two years before it can be coppiced, which is cutting off the shoot (the upper-portion of the tree) but leaving the roots, so a new shoot can grow. The severed shoot is stripped of its bark; the inner bark is used to make the cinnamon while the outer bark is made into quills (cinnamon sticks) and sold. While many countries where the Cinnamon tree is not native (all other countries except Sri Lanka) produce it commercially, the Sri Lanka Cinnamon trees are believed to make the best cinnamon. There are different types of cinnamon, and when people say the word “cinnamon” with no other description, the variety is assumed to be the pure cinnamon, or Ceylon Cinnamon. This is the Cinnamon that comes from the Cinnamon tree Cinnamomum verum. However, there is another type of Cinnamon tree, Cinnamomum aromaticum, which doesn’t produce the true cinnamon, but something very similar. This imitation cinnamon is called Cassia Cinnamon, and although it is not the “pure” kind, the majority of all cinnamon sold it in the United States is Cassia. Cassia Cinnamon is different from Ceylon in that it is stronger, thicker, and harder. The reason for this is that with Ceylon Cinnamon, only the inner bark is used to make the cinnamon, but with Cassia, all the bark is used (and it’s a different species of tree). While the sticks of the two cinnamon types are easily distinguishable, the ground form is not, although there are different techniques that can be used to figure out what is what. Cinnamon can basically be put in any food. It is put in pancakes, eggs, cakes, chocolate, candy, and is even used to add extra flavor to fruits (apples, cherries, pears), and cereal. 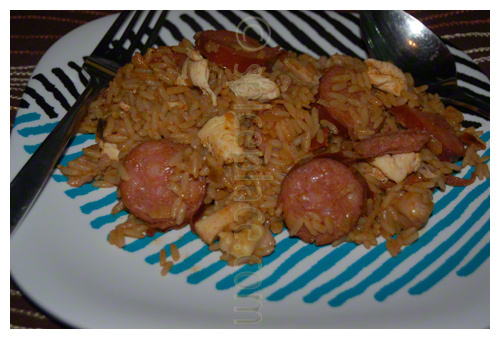 In the Middle East, it is put in other foods that many Americans wouldn’t think about adding cinnamon too, such as lamb. Besides being used heavily as a spice to make tasty foods even tastier, and add flavor to bland foods, it also has some medical uses. It can treat colds, and people used to believe it was a straight up cure for it. Cinnamon is also used to treat a variety of digestive problems, such as upset stomachs and diarrhea. Cinnamon is high in antioxidants, which are important in reducing damage that cells endure regularly. Many commercials promote the fact that their product is high in antioxidants, and cinnamon is no different. The oil that cinnamon has is antimicrobial, which kills or slows the growth of bacteria, viruses, and other things of the like. While this does little for the human body, when cinnamon is placed around other foods, it prolongs their life (how long before they come inedible). Studies have shown that cinnamon has great effects on people with Type II diabetes, but while the media portrayed the studies as showing that true cinnamon was beneficial, it was actually cassia that was used in the studies. Another fantastic use of cinnamon is its use as an insect repellant (kind of odd considering how good it smells). Many independent farmers do not like using insecticide because of its harmful side effects on humans, but cinnamon is a safe way to keep the bugs out and the crops safe. The history of cinnamon is not a brief one. It dates back to as far as 2000 BC, and at that period was given as a gift to high leaders and rulers (it wasn’t as easy to make back then). Cinnamon is also mentioned many times in the Bible, adding to its value. In the Middle Ages, western world dwellers didn’t even know how cinnamon was made, as it was just exclusively imported from the other side of the world. Over the years, many different peoples dominated the spice trade (therefore the cinnamon trade as well). It was the Portuguese who actually discovered Ceylon is Sri Lanka, and they had a monopoly for over a century, and they fought hard to preserve it. However, the Dutch defeated them by making an alliance with another kingdom, and they completely expelled the Portuguese and used their own methods to produce and trade cinnamon. By the time Britain dislodged the Dutch, cinnamon was already declining in popularity and was spreading to other areas. Also, Cassia was becoming more popular, and Ceylon was no longer the only bark from which cinnamon was made.